The keen eye will notice that all but one set of adjacent rows on a regular keyboard are aligned at half-key increments: the top and home rows. That is to say, the number and top rows, as well as the home and bottom rows are nicely aligned, but the home and top rows are not. I suspect that having the two aforementioned rows nicely aligned contributes to a more consistent keyboard (i.e. every key is evenly spaced from its neighbor), which reduces learning curve, fatigue, maybe manufacturing costs, etc. Consistency is very much a motif in our world that makes using a product that much more enjoyable. Also, the strange staggering offset seems rather arbitrary. Half a key seems cleaner and more thought-out than what currently exists. What's so horrifically wrong with these designs that I can't find a single keyboard—old or new—with nicely-aligned home and top rows? You may find this thread relevant. In a nutshell, it's a legacy design trait from typewriter days, and there hasn't been much reason to change it. 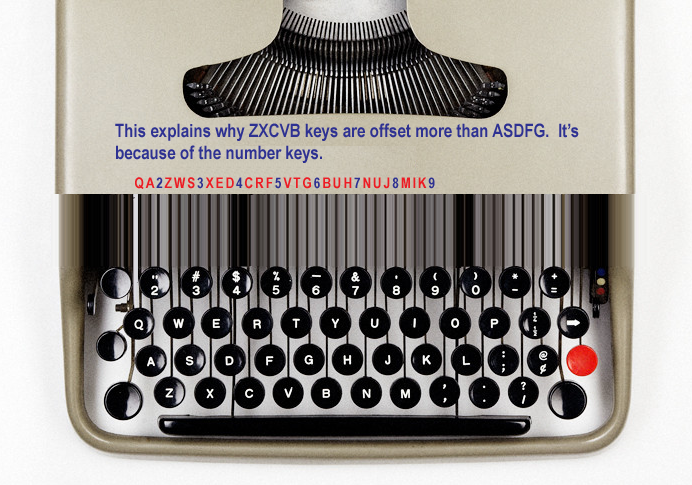 As for 'why' older typewriters had uneven offset; below picture gives you a great visual representation of why the "ZXCV" row of the keyboard is offset more. It's because it needs to make room for levers for number keys at the top. For example, in between "A" and "Z", there needs to be a room for "2". Edit:2 I think below pix should make poster's question more clear. Not the answer you're looking for? Browse other questions tagged design keyboard keyboard-layout ergonomics or ask your own question.